Gospel of Life Ministries is an interdenominational effort to end abortion. It encompasses outreach to clergy , laity, government officials, those hurting from abortion, and all people of good will. Gospel of Life Ministries is a 501 (c) 3 tax exempt organization, and has been issued a determination letter from the IRS confirming its tax exempt status, as of February 21, 2012. 2018 is the 20th Anniversary of the Bishops' document, Living the Gospel of Life. 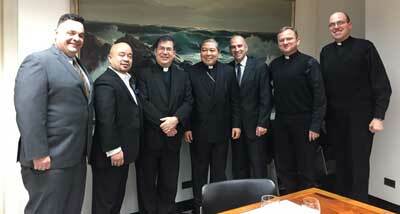 Click here to watch commentary on this document by the Priests for Life Pastoral team. 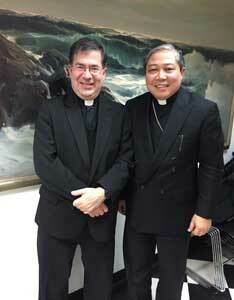 Father Frank Pavone visited with Archbishop Bernardito Auza, the Pope's Representative at the United Nations. The meeting took place at the Permanent Observer Mission to the United Nations in New York City on Saturday, December 6. Father Frank is joined by some of his team and by some of the priests who work at the Permanent Observer Mission in the December 6 visit with Archbishop Bernardito Auza, the Pope’s Representative at the United Nations. Father Frank and his team interact often with the Permanent Observer Mission, particularly through the Gospel of Life Outreach in the work done by Marie Smith and our international coordinator, Bob Lalonde. 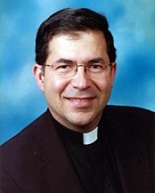 Priests for life is a registered Non-governmental Organization at the UN, and works to make sure that the right to life of the unborn is both represented and protected as various UN documents are negotiated and passed. Priests for Life make available. Gospel of Life Ministries and the Parliamentary Network for Critical Issues (PNCI) equips and encourages individuals to engage in the political process and works to ensure that elected and appointed officials not only uphold their obligations to protect life but are assisted in such efforts. Click here to listen to our radio spots! We at Gospel of Life Ministries take seriously the words of St. Paul when he tells the Ephesians, "Have nothing to do with the fruitless deeds of darkness, but rather expose them" (Eph. 5:11). Injustice and wickedness always flourish when they are hidden. "This is the verdict: Light has come into the world, but men loved darkness instead of light because their deeds were evil. Everyone who does evil hates the light, and will not come into the light for fear that his deeds will be exposed. But whoever lives by the truth comes into the light, so that it may be seen plainly that what he has done has been done through God" (Jn. 3:19-21). With these Biblical lessons in mind, we support efforts to show the public what abortion actually looks like. In fact, efforts to expose the graphic reality of abortion convert people every day to the pro-life cause. To see an extensive gallery of pictures of abortion, and to read firsthand descriptions of the procedure, click here . Our Clergy may be coming to your area! Click here for our travel schedule. To be effective, pro-life advocates need to be fully informed of recent developments in the cause. We are therefore happy to provide access to the latest news stories affecting the pro-life movement. Latest news on abortion. At Gospel of Life Ministries, we are grateful for the many courageous people who have shared their lives, their pain, and their stories of salvation through the gift of writing. Many such works convey the pro-life message. There is also a constant stream of academic research being published in the pro-life arena, including so much new evidence about how abortion harms women. To see some of the highlights of the recent publications in the pro-life movement, click here.